We offer a variety of classes in printmaking and book arts, including Intaglio, Relief, Papermaking, Book Arts, Journal Making, Screenprinting, and Monotype. Discover a new, wonderful way to make linoleum prints! 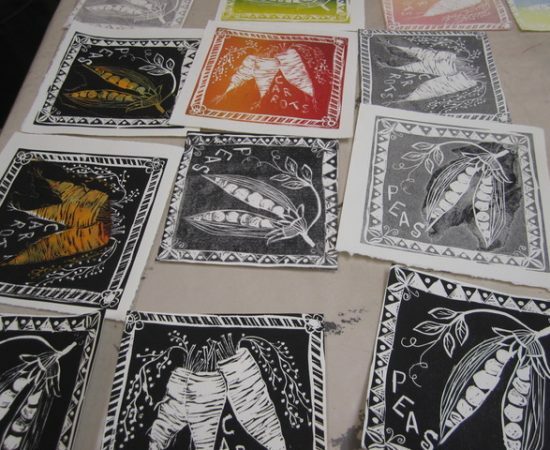 This workshop will introduce you to linoleum relief printing, and/or help you take your current printmaking practice a step further. Imagine cutting through butter, the possibility of long, flowing organic lines, easy removal of large areas, creation of a variety of marks and no tension in your wrists or fingers. This is all possible with Silk Cut Lino, a wonderful product from Australia, now available in the Bay Area. Learn new carving, inking and printing techniques, using simple, non-toxic materials. Innovative printing techniques that yield high numbers of surprising, one of a kind prints, with little or no re-inking! students. 6×6” blocks @ $6.00 each.Please feel free to bring your own source materials such as drawings, photographs, etc. Robynn Smith is an internationally exhibiting painter/printmaker and Professor Emeritus at Monterey Peninsula College. She is the founder of Print Day in May®, an annual international celebration of printmaking involving participants from all 50 US states and over 50 countries world wide. Robynn grew up in New York and has lived her adult life in Santa Cruz, California. She was educated at Rhode Island School of Design (BFA) and San Jose State University (MFA). Robynn travels a great deal and enjoys participation in international exhibitions and residencies. She has vast experience teaching workshops for artists of all levels. She teaches workshops and holds salons at Blue Mouse Studios in Aptos, California. Robynn is available to teach workshops and serve as a visiting artist in studios and educational facilities in the US and and abroad.